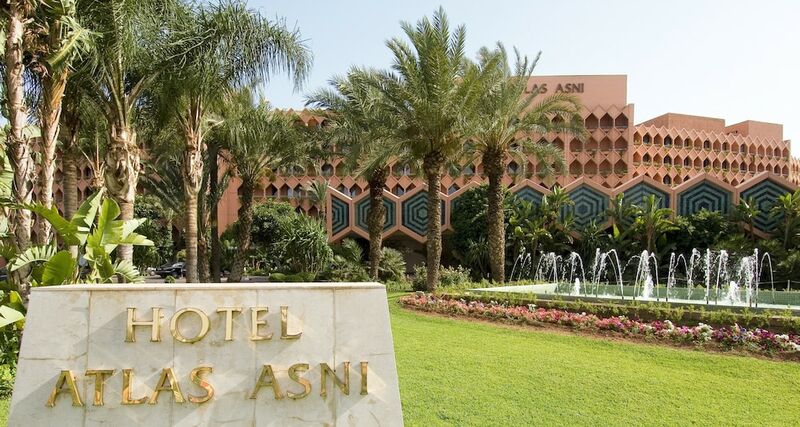 With a stay at Hotel Atlas Asni, you'll be centrally located in Marrakech, just a 4-minute walk from Palais des Congres and 6 minutes by foot from Menara Mall. This 4-star hotel is 1.8 mi (2.9 km) from Jemaa el-Fnaa and 1.9 mi (3.1 km) from Menara Gardens. Make yourself at home in one of the 334 air-conditioned rooms featuring LED televisions. Complimentary wireless Internet access keeps you connected, and satellite programming is available for your entertainment. Private bathrooms with shower/tub combinations feature complimentary toiletries and bidets. Conveniences include phones and blackout drapes/curtains, and housekeeping is provided daily. Pamper yourself with a visit to the spa, which offers massages, body treatments, and facials. You're sure to appreciate the recreational amenities, including a nightclub, an outdoor pool, and a steam room. Additional features at this hotel include complimentary wireless Internet access, gift shops/newsstands, and a hair salon. Grab a bite at Le Relais, one of the hotel's 3 restaurants, or stay in and take advantage of the 24-hour room service. Unwind at the end of the day with a drink at the bar/lounge or the poolside bar. Breakfast is available for a fee. Featured amenities include dry cleaning/laundry services, a 24-hour front desk, and multilingual staff. Planning an event in Marrakech? This hotel features 6458 square feet (600 square meters) of event facilities. Free self parking is available onsite.